Bio Skin's complete range of knee braces, ankle support, back braces, wrist braces, calf sleeves and compression clothing is constructed of patented proprietary fabrics that's both latex free and neoprene free. Each Bio Skin brace is designed to provide compression and reduce swelling while offering effective support for all day wear, sports use, and injury recovery. 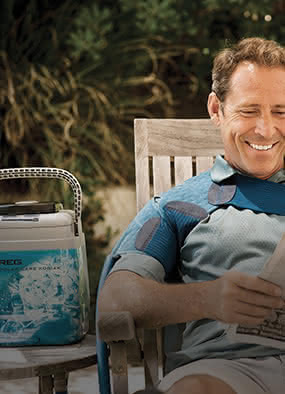 DME-Direct carries the complete line of Bio Skin braces and compression clothing for post-op and injury recovery. Search our categories below to find your favorite Bio Skin products or call our customer service experts for assistance and answers to all your brace questions . Official Bio Skin Braces Distributor - 100% Authenticity Guarantee - Ships Today. BioSkin Shinsplints Wrap With Pad, 5"
Bio Skin is available in four different proprietary materials: Ultima, Ultima 2s, Ultima 2sL, and Stratus. While their actual composition varies slightly, all four materials can be used for any type of situation. It's thinner than neoprene, and stretches to conform to the shape of your body for effective compression and support.